If I ate nothing but the apples that Laura and I recently picked I bet I could live for a month without really ever feeling hungry. (I’m sure I’d feel a lot of other things with that kind of diet, but the point is that I’d survive). The thing is, I don’t really need all these apples to survive; though I’m not rich I’ve always had enough money to buy food. That means that the apples are all extra food. Nice, but not necessary. As I’ve thought about the vast amount of extra food that I’ve acquired in the last few days I’ve found my thoughts turning to people who don’t have food at all. As I understand it, there are many parts of the world plagued by hunger, malnutrition, and famine. Accordingly, while I picked apples I began to wonder why we couldn’t send all our surplus fruit to those places. There are, of course, practical problems with sending something like apples to places like Africa. Though it could probably be done, preserving the fruit for that long would probably be inefficient and costly (and other kinds of food would be much better to ship). Likewise, planting apple trees in locations where there are problems with hunger would also not work because of the climate. Thus, my conclusion was that the apples I picked could not realistically contribute to ending world hunger. Or could they? While there are many ways to alleviate world hunger without local apples, the fact that they may provide extra food leads me to believe that they might contribute by freeing up funds that would otherwise be spent on food. So, for example, if I’m able to eat apples for breakfast for the next week, I have theoretically saved some money by not buying my normal food, which could then be donated to those who don’t have food (a familiar idea to my fellow Mormons out there). While my own charitable contributions could no doubt help many people, I can’t help but wonder if this idea could make a huge dent in world hunger. Let’s estimate that the typical city block has 300 residents (that’s way too high if you live in the suburbs but probably low if you live in a high rise). Now, lets imagine that each of those people ate two apples a day for breakfast for a week. If each person normally spent one dollar on break fast, that means each person has saved seven dollars by eating apples. Collectively, the block has saved $2100. Now imagine if most of the blocks in a given city tried that. Imagine if most of the cities in the United State tried it. Very quickly there would be millions (or probably billions) of dollars. This plan would be incredibly easy to implement. 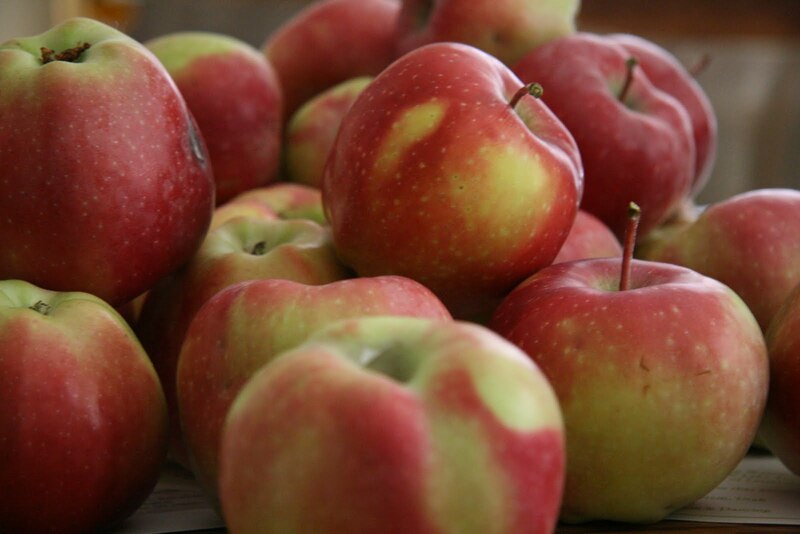 300 people eating two apples a day for seven days would require 4200 apples. Lets say each tree that was planted ended up being really scrawny and only produced 300 apples. That would mean that the block of 300 people would need 14 trees. The typical residential city block has more than 14 yards, so that would be fewer than one tree per yard. In reality, however, each block would probably need far fewer trees (though I don’t see why they wouldn’t want even more). Obviously it would take a few years for the trees to produce, but when they did the results could literally change the world. As was the case with my previous apple picking post, I know that this boils a complex problem down to an oversimplified solution. I’m also not under the delusion that it is about to happen. Still, it should more or less work. It would require innovation and experimentation and would only bring about change over a long time, but it points out that the possibility of solving world problems actually exists. My apple picking experiences have reminded me, then, that what we (myself especially) lack is simply the will to do even the simplest things to make a difference. My recent apple picking experiences have led me to ponder the roles of urban vegetation. These experiences have also reminded me of a presentation I attended a while ago at the old Gallery 110 in Provo. The presentation was on urban gardening and while I felt the presenter focused too much on symbolic acts of urban guerrilla environmentalism that ultimately couldn’t effect any change, it was a useful experience for pointing out that most city plants exists only for beautification purposes. The apple trees that Laura and I recently found and harvested are a good example of this fact. The trees provide shade and look nice, and for most people that’s apparently all they’re good for. Similarly, Provo and BYU campus have numerous plum trees all over, but they’re trimmed to minimize how much fruit they produce because the fruit is seen as a nuisance that dirties sidewalks and streets. And of course, most lawns, trees, and bushes in urban environments bear no fruit at all and simply exist for people to enjoy. I appreciate plants that beautify, but picking bag after bag of apples recently has led me to consider more seriously why urban vegetation can’t be visually pleasing and productive. Would Provo’s plum or apple trees be any less pretty, for example, if they were pruned to maximize their fruit yield instead of being trimmed to eliminate it? As I run and walk the streets of Provo (and, in the past, other cities I’ve lived in) I always notice new saplings planted in parks and yards. Occasionally these are fruit trees, but usually they aren’t. Why is that? What is to be lost by planting fruit trees more often than simply “attractive” trees? There may be slightly more research required to maintain a fruit tree (though any nursery worker should be able to answer questions), and of course someone will eventually have to make the effort to pick the fruit, but those seem like small prices to pay for the reward of having delicious homegrown food (that is also essentially free). There are opportunities to turn urban settings into productive gardens right now. Again, Provo’s fruit trees provide a good example. Right now someone has to go around and trim them, so if they’re putting forth the effort anyway why not spend a little more time and prune them for their fruit? Of course, this would take some extra training and know-how, but the fruit itself could easily offset the cost. For example, cities could plant fruit trees along boulevards and pedestrian paths, and then charge local residents a small fee to come and pick the fruit on certain days of the year. It’d be like going to a farmers market, except that the “venders” (i.e. the trees) would be spread throughout the city and people would get to pick the fruit themselves. Cities could make a little extra cash, people would get fresh organic food, and there wouldn’t be rotting undersized fruit all over sidewalks. Everybody would win. I know that’s a simplified assessment of the situation, and I’m not advocating some kind of public orchard system. Instead, I think that urban vegetation could serve many communities much better than it currently does. I don’t think (as some do) that every square inch of dirt in a city needs to be planted with carrots and lettuce (though I’m not opposed to that idea), but it seems that many communities currently put forth a lot of effort to maintain their plants. Why not focus that effort so it produces both beauty and fruit? A couple of weeks ago Laura and I went on a walk and passed an apple tree in front of a small apartment complex. We probably wouldn’t have noticed it, except that the ground around the tree was covered in decomposing apples. When we looked up we were surprised to see that the tree was still full of fruit. Laura picked one and tasted it, and when she said it was delicious we decided to come back with bags and pick more. After all, we figured, the number of apples on the ground suggested that no one else was interested in them. 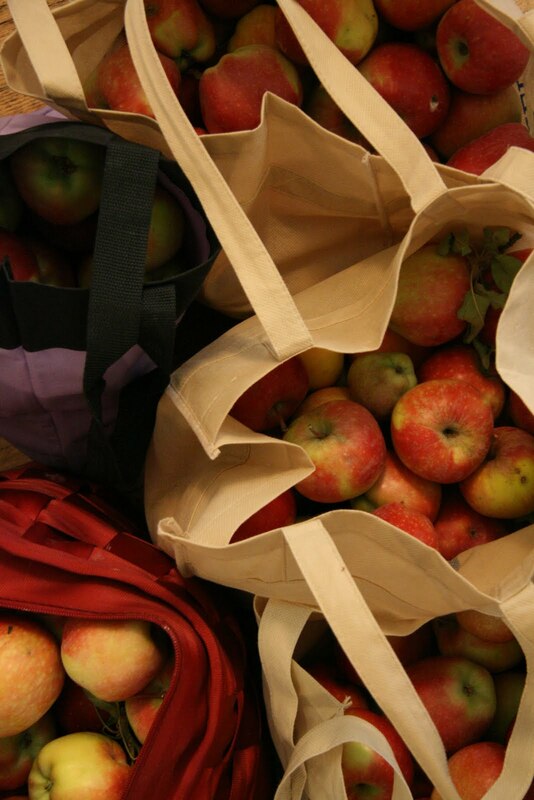 Because the apples weren’t necessarily ours, we felt the need to be sneaky. The first time we went back there was a guy in front of the apartments barbequing, so we pretended we weren’t there to steal his apples and kept walking. Then, later that night after it was dark, we stealthily returned and proceeded to pick more apples than we knew what to do with. Now, it’s possible the guy just wanted us to leave and so he made up an excuse to scare us away. However, if that was his goal he failed because Laura had already eaten some of the apples and was just fine. Also, I had never heard of anyone dying or becoming sick due to box elders. Nevertheless our bags were full (we probably had a bushel or more), so we left. Since then I’ve tried to look up the dangers of box elders, but to no avail. More importantly, Laura and I have made numerous loaves of apple bread, apple pies, and eaten many raw apples with no negative repercussions. If we found a bug-infested apple, we threw it in the compost pile (which is also a secret that I’m hoping will totally decompose before the landlord notices it). In the end I’m left to wonder why the barbeque guy was afraid of the apples in front of his apartment (if he was serious about them being bad, which I believe he was). Since then Laura and I have actually found another apple tree at another apartment complex and picked even more apples. (In fact, we picked at least twice as many from that tree and had to make two arduous trips to carry them all home.) Like the first tree this one was surrounded by fallen, decomposing apples. Clearly, no one wanted them and I felt like it almost as my duty to pick all the remaining good apples and eat them so they wouldn’t go to waste. While I’m glad I benefited from these trees, there was more than enough for everyone in the vicinity, if anyone had cared to look. While I’ll explore some of the larger thoughts I had about this experience in subsequent posts, the most basic conclusion that I’ve come to is to not be afraid to take a risk (in this case that risk was the very slight chance of becoming sick from eating a bad apple, but I suppose there are broader applications to that idea, which I’ve commented on before). The other basic idea that I think emerges here is that there are free, delicious, and abundant resources all around us all, ripe for the taking.